If the Runner has exactly 1 when Fairchild 2.0’s first subroutine resolves, what happens? What if the Runner has no installed cards? The Runner must choose an option they are able to fulfill if possible. If they don’t have 2, they must trash an installed card. 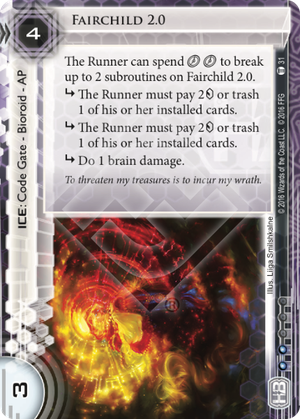 If the Runner doesn’t have any installed cards, they can’t fulfill either option, so they get to keep their 1. This is a really really good ICE! Anarchs can't kill it with Spooned and clicks like Fairchild 3.0 as they can only break 2 subs. On the other hand it won't stop the runner, so it's more interesting on a central when they are running through it multiple times. The tax of 2 clicks + 2 creds is really nice and makes it more taxing then Fairchild 3.0 without a breaker (or at least the same)! The standard Anarch breaker Black Orchestra needs to pay 5 credits (3 to break 2 subs + 2 tax for the ICE). It's also a good Tax for Gordian Blade as 3 subs still mean 3 creds regardless of Gordians strength. So this is a nice taxing ICE, love to use it on all Central Servers. Runners hate it.